We have to go back in time again to discuss the genesis of King’s tenth published novel, his third under the Richard Bachman pen name. In 1973, he finished the first draft of ‘Salem’s Lot (known as Second Coming at the time). Carrie was slated for publication the following spring. However, his mother, Ruth, died in December of that year after a long and painful illness. She knew her son would be published, but never got to see it happen. Her death left King grieving and shaken by the apparent senselessness of how cancer had tormented her. In an effort to work through his thoughts and feelings about this loss, he started writing Roadwork. The book has a number of autobiographical aspects. The protagonist, Barton George Dawes, has recently lost a family member to cancer. Like King, who memorialized the experience in his short story “The Mangler,” Dawes worked at an industrial laundry. In fact, the company has the same name in both stories: The Blue Ribbon Laundry, and the ironing machine in Roadwork is nicknamed “the mangler.” Anyone who suspected that Bachman was really King would have their smoking gun from these details alone. As a literary novel, it wears some of its influences on its sleeve. An off-screen character is Dawes’ cousin Nick Adams, an outdoors-type from Michigan who is fond of hunting. He is named after the protagonist of a collection of short stories published by Hemingway in 1972, partly inspired by Hemingway’s experiences in northern Michigan. In a letter to Michael R. Collings, King says that he was also influenced by Kurt Vonnegut’s Slaughterhouse Five and its use of white space in the book’s structure. Both Vonnegut and his novel are mentioned in Roadwork. 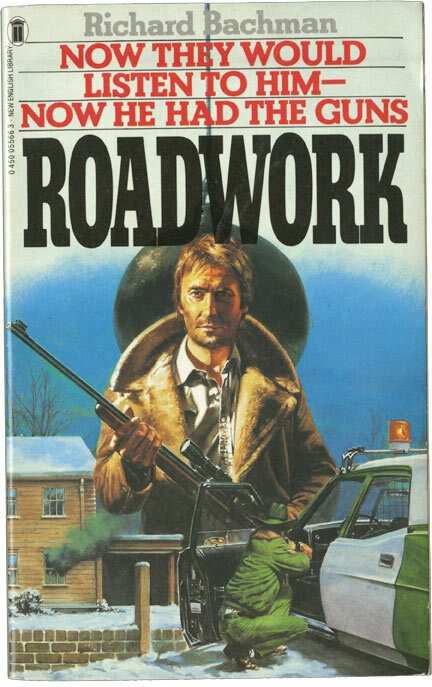 More than any other book, either released under his own name or the Bachman pseudonym, Roadwork deals directly with the sociopolitical reality in the US at the time it was written. The energy crisis, inflation, the Nixon administration and the end of the Vietnam War are all events that King drew from in creating the social climate in which Dawes finds himself. Though in the first introduction to The Bachman Books, King calls Roadwork probably the worst of the early novels “because it tries so hard to be good and to find some answers to the conundrum of human pain,” he says in the second introduction that it is his favorite of the four. He seems to envy Bachman for being simultaneously funnier and more cold-hearted than he was. Roadwork was published by NAL in April 1981 to absolutely no fanfare. The same laundromat will make a cameo in the forthcoming Hulu series 11/22/63. The book was dedicated to Charlotte Littlefield, a fellow teacher at the Hampden Academy, which would have been another piece of ammunition to support the hypothesis. I find it interesting that the inciting incident in Roadwork, the decision to build a road through both his home and his place of work is similar to the beginning of Douglas Adams’ The Hitchhiker’s Guide to the Galaxy, which was written after but published before Roadwork. Yes, I know that in the afterword to Different Seasons he says it was Blaze, but at that time he couldn’t admit to it being Roadwork without blowing Richard Bachman’s cover. He tells the real story in an interview with Christopher Lehmann-Haupt in The Paris Review, which is where the following quote comes from. I wish i would have read this before reading roadwork! again i love the backstory behind the stories! Thank YOu! learned alot! Keep them coming! “He seems to envy Bachman for being simultaneously funnier and more cold-hearted than he was.” – This is a brilliant summing up. It helps to explain Bachman’s special appeal not only to King, but to King’s readers. That’s the difference between King and Bachman. In most of King’s books order is restored after the Bad Thing is conquered. In Bachman books things don’t always work out so well. This is one of my very favorite King books. It’s beautifully written and so powerful. I read ROADWORK–which was the first of the Bachman books I found–before the true identity of “Richard Bachman” was revealed, but knew that if “Bachman” wasn’t King, he had certainly *read* King. It’s my favorite of the four Bachman books as well. Excellent essay. I’ve been more or less keeping up with this project. Currently re-reading Different Seasons. Apt Pupil is dragging a bit for me. I re-read all the Bachman Books and liked Roadwork the least. I LOVED The Long Walk second time around. King’s editor was right. Roadwork is OK at best. I don’t think I’ll be reading it a third time, that’s for sure. I really enjoyed this bit of Kingian History. Thanks for the article. I love all of this great info. Wonderful article about a very interesting book, ROADWORK. Although I had my suspicions years ago that Bachman and King were one in the same, because of the unique writing style. Thank you. I love the way you put this book in to the context of the time, both in terms of King’s writing but also world events. It’s fascinating. Makes me want to read this book again. I have only read it once, more than thirty years ago, but I do remember enjoying it. Keep them coming please! Thanks for the info Bev. I really need to check this one out again. Thanks Bev for another great historical essay. I always read these before I start the next book on the list as a little warm up. I didn’t know that King submitted this one with Salem’s Lot to his publisher after the success of Carrie. Very interesting. Talk about two completely different books! LOL And I also didn’t know that this was the book that he wrote after the death of his mother. Makes a lot of sense why the book was so dark. Lose a loved one, go into the Bachman frame of mind.